As you can see on my latest posts, I LOVE THE AUTUMN. Really. And I love it double as much when the weather's nice and I am able to leave my flat in the middle of the city and visit my parents who have a big house and a much bigger garden. But having a big garden always means that there's gardening stuff to do. My parents do not have time to plant vegetables but they have some herbs and a lot of lowers and trees in the garden. And there's also always someone needed to mow the lawn. It was my job today and I enjoyed it as I always enjoyed mowing the lawn. I don't know why, I loved it. So I spent a couple of hours today afternoon in the garden and I did what I had to do. I also reaped the pumpkins you can see in the last post and I saw that the cat who lives in the basement has two little kittens. It was only possible to catch one of them with my camera. But they're both so sweet. The second one is white-black. More white than black. The time in the garden was great and I have the good feeling now that I indeed worked with my hands, because gardening on my balcony in the middle of the city DOES NOT COUNT! 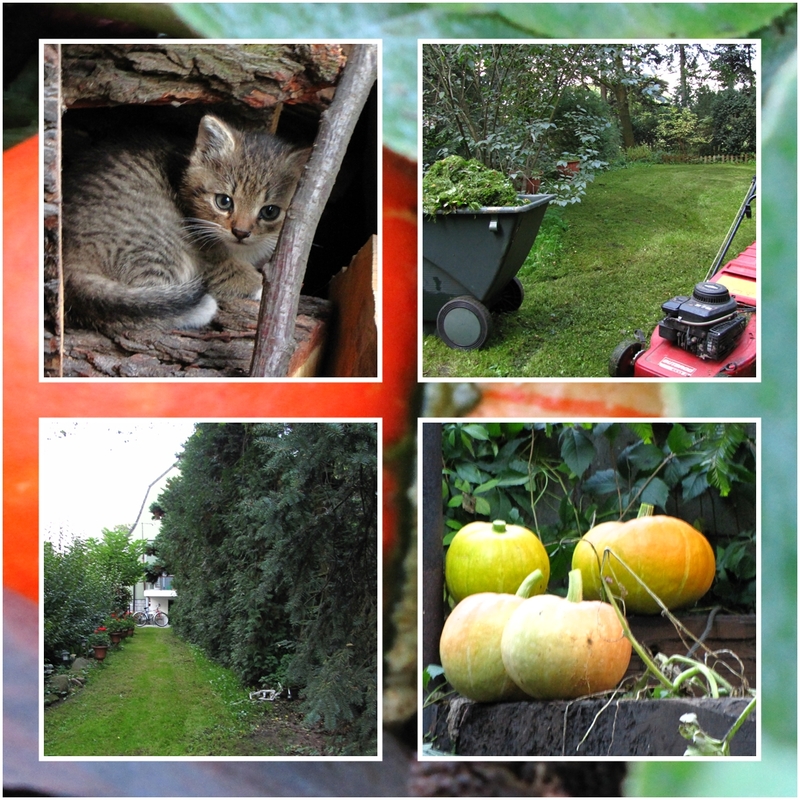 :) Here are some impressions and effects of my gardening and time I spent outside.